Hello cat lover (or future cat lover). I am Heidi and I am living in Italy with my husband Mark and we presently have a dog and five cats, one of which is blind. In case you think about having a cat or rescuing one from a shelter and you never had cats before, I want to tell you a little about me and how I came to love cats. I actually always was fearful of cats up to my thirties. I had believed what people say about cats: they scratch you, they are aggressive and they are false – which kept me from ever touching such a wonderful creature. Fear is not a good master. But once I visited a friend and she had a little black kitten. It was soooo sweet and she offered me to hold it for a while. I overcame the inner voices which warned me about all the bad impacts of cats on humans – and I held the cat and immediately fell in love with it. There were some tiny claws, yes, but if I (myself) was careful, they wouldn’t hurt me. This is me and Trixi at my neck. The photo was taken during my afternoon nap a few days ago. When I started to live in the Italian countryside somebody gave me an adult black cat. Adult cats are certainly different than kittens and I still was sort of fearful, but courageous enough to try to get in contact. I succeeded to have it on my lap, but I still wasn’t able to accept, that the cat wanted to lie on my chest and around my neck. It took some more cats in my care until I was fully confident and now I enjoy my kitties being with me, laying on top of me or on my side, on the sofa, in bed, everywhere and I LOVE it. I have a deep relationship of friendship and trust with them. 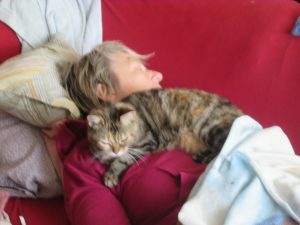 I have learnt how to BE MYSELF in order to allow the cat to be in close contact with me and to enjoy my presence. I had more than 40 cats in about 25 years, many not alive any more, for various reasons, illnesses, old age or poison by heartless hunters whose aim it is to kill foxes. The title for this website comes from the last challenge we are facing: a blind cat finding her way in our house and with the other animals around. You will find a lot of stories posted in the blog in time, so I don’t abuse your attention here on this page. 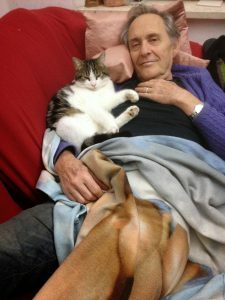 I just want to convey to you that caring for animals, especially for cats, is a huge joy. They will love you if you treat them in the right way. There are challenges and hard times to go through, sometimes, and every illness or death will be a difficult moment. But they will bring you in a even deeper relationship with the animal and its beautiful soul. So, when overcome, all those problems actually are possibilities for more love and connection. Nice topic focus. Pets are wonderful. I’ve never had a cat, but I can imagine they, like any other animal, can bring you a lot of joy. I’ve had rabbits and a bird, and I loved them as pets. This post reminded me of my goal to have more animals in life again some day. For my next pet, I think I’d like to have a dog or a reptile. Yes, two very different kinds of animals, but still, that’s what I think I’d prefer. Yes, animals make our life richer. Everybody likes different animals, you like birds and reptiles, I like cats and dogs and sheep. You need to have some time for being with them and treating them well, but it is a great joy when they become affectionate to you. Thanks for your comment! And good luck with your next animal! A wonderful website. Easy to navigate. The articles are well researched and written. I love the site layout. Thank you Irvine, Glad you like it. I was intrigued of the homepage function and navigation when I choose the theme. Glad it worked for you out as I had intended! Thanks Kerry, for your kind comment. Yes, all animals are beautiful, and especially cats and dogs, since they are living with us humans for such a long time and we have created a relationship between the species. I can understand that 2 dogs are too much for a cat. She could manage one, but 2 can really catch her, I saw that in the past. And, yes, the cat hair allergy is quite a nasty thing. I have often guests in my house and I take care to not allow my cats to enter the guest appartments. It is a real problem otherwise. Hi there, you are a big cat lover. I did not even have a cat in my life. Never rally liked them so much. We had few dogs but after we lost last one we decided not to buy another one. Good article, thanks for sharing your story. I am glad you like our story. Maybe you will get a cat some time in your life – they are great company especially when you live alone . They need much less attention than dogs because they are autonomous and can live without people. Dogs need the contact to their top-dog. So it is much less preoccupation to have a cat than a dog which asks you to go out for a walk every day….. I have never seen so many cats in one place. Your site is very colorful and well laid out. Will recommend to my cat lover friends. Have a great day. Never had a cat for the same reasons you mention, plus growing up I was attacked by a Siamese cat so I have always been very wary of cats. Glad you put this site together to help inform people about what they are all about. Thank you Helen for commenting. Seen from my present perspective I would miss a whole lot if I hadn’t overcome the fear of cats. I really love them dearly, also because they are highly autonomous beings – and at the same time often very sweet and endearing. Thank you so much for this delightful post on cats. I, too, am an avid cat lover and prefer them over dogs or any other companion animal. Cats are so smart. Every day, at exactly 11:45 am my siamese lets me know that it’s time for his walk. He waits for me to put the harness on him and attach the leash then we are out the door to greet the neighborhood. He’s a real character and gives me so much joy. Yes, it is sooo much joy to live with these fur balls! Thanks you for this comment! I wonder if you would like to write a story about your siamese with some pics and I publish it as guest post? I love to hear other people’s experiences with their beloved ctas!